Vladislav Artemiev is the new European Champion. | Photo: Maria Emelianova/Chess.com. 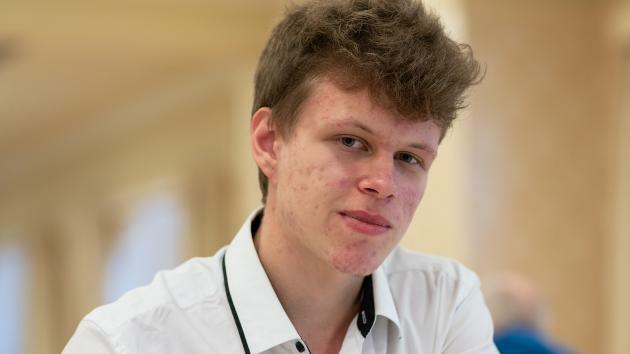 After winning in Gibraltar, Vladislav Artemiev scored his second big victory of the year at the European Individual Chess Championship in Skopje, North Macedonia. The Russian GM edged out Nils Grandelius on tiebreak after both finished on 8.5/11. Both earned €17,500. We left the tournament after five rounds, when the players enjoyed a rest day. Six more rounds were played, with the last round on Friday. Artemiev played his tournament in solid Russian style, winning all his white games and drawing his black games (except for the first round, when he beat his opponent as Black). All these white games were highly interesting. First, round six, against one of his compatriots from the same generation, 20-year-old David Paravyan. What a wonderful battle, not without mistakes but with great fighting spirit from both sides. Two days later Artemiev got the opportunity to play a combination that will reach magazines and books for sure. His opponent was the experienced Czech grandmaster Zbynek Hracek. Can you calculate all the lines? Artemiev vs Esipenko. | Photo: Patricia Claros/EICC2019. The next day Grandelius was on the winning side of another theoretical Najdorf, against rising star Vincent Keymer of Germany, who will make his debut in a super tournament next month at Grenke. Vincent Keymer. | Photo: Maria Emelianova/Chess.com. There were many more interesting games played in this tournament with 361 players from 42 federations, including 143 grandmasters. Here's a few more nice ones. In the same round we saw the interesting endgame BB vs N in the game between 17-year-old Polish IM Szymon Gumularz and 27-year-old Armenian grandmaster Robert Hovhannisyan. From the start it was a forced mate in 36, but in the game it went a bit faster. Somewhere in the middle of the playing hall, in a rather anonymous corner, a small drama took place for Belarusian GM Sergei Zhigalko in round eight. His opponent, IM Petro Golubka of Ukraine, decided to postpone his resignation a few moves, until he suddenly escaped. It has been reported that Zhigalko's head and the wall of his hotel room had a rendez-vous that night. It was good to see another Russian rising star of the other gender also participating: Aleksandra Goryachkina. (The European Championship for women starts April 10 in Antalya, Turkey.) 27 more female players participated, but the Goryachkina was the only one to finish in the top 100. On Thursday one of the top boards saw a fascinating dance of four knights between Nils Grandelius and David Anton. Why the Swedish GM missed the chance to draw with a lone king against two horsies remains a mystery. Grandelius vs Anton. | Photo: Patricia Claros/EICC2019. Below are the final standings and the (unofficial) qualifiers for the World Cup according to Chess.com's calculations. The European Individual Championship was held for the 20th time this year. It was an 11-round Swiss held March 18-29 in Skopje, North Macedonia. It was organised by the government of North Macedonia together with the Agency for Youth and Sport and the North Macedonia Chess Federation under the auspices of the European Chess Union.